News How do you build a bridge from one culture to another? Cultural Infusion is excited to welcome civil engineer Yves Nininahazwe to our Schools Incursions as part of our new Science program. This new program makes professional scientists from around the world available to Victorian schools. Yves was born and raised in Burundi, in central Africa, which has a population of 10 million people. After completing high school, he received a scholarship to study in China. He completed his degree in Nanjing city, where he also met his wife. Together they decided to migrate to Australia and build their lives. But civil engineering wasn’t the path Yves originally wanted to follow. “When I left Burundi, my plan was to study to be a doctor. However, when I arrived in China, I found that many of the students wanted to be doctors. And I thought, well, that is enough doctors. I thought, well, if we have all these doctors, we are going to need engineers as well. When his studies began, Yves was challenged in a number of ways. If you can imagine what it must feel like to learn a specialised science in a language you don’t speak, then you can see why those challenges arose. One of those international students was Frances, an Australian who was studying Traditional Chinese Medicine. The two of them fell in love, and once they had graduated, the pair travelled to Burundi to meet Yves’ family. After the introduction, Frances returned to Australia, and they had to live apart for almost a year while Yves waited for a visa. Yves said that he found the wait very difficult. Yves credits his father for fostering his interest in learning. His father was a teacher and emphasised the importance of education. In 2011, Yves graduated as a civil engineer (now fluent in English, French and Mandarin). He returned to his home country to put his skills to use. Helping to bring change to Burundi was a profound experience for him. “The work we did in Burundi was for rural areas, where there was no access to electricity. I worked for a company that was building small hydroelectric dams to produce electricity. “That was work for me that produced impactful change and changed people’s lives; I was proud of that. It meant that students could spend more time at school, as they were able to stay there with functioning lights, after dark. Furthermore our work [was essential] to smaller companies, and again, essential to [the equivalent of] the council in that area to power offices. It meant they could do the work they needed to do. For Yves, the right direction is the one where the community is active and engaged in driving progress. He is passionate about the relationship that a community bond provides. He found a similar sense community support here in Melbourne, in a community house where he was first informed of the Migrant Scientist programs run by Cultural Infusion. Yves is excited to start work on the programs and looks forward to talking to students about issues he feels are important to outline with students. There has been a drop in the interest of science-related studies in Australia and he wants to help resolve it. Yves says there are two main issues that the Migrant Science programs aim to attend to. “There aim [of being a Science Communicator] is to equip overseas qualified professionals who are struggling to find work in their chosen field, but it is also to address another problem: the drop of interest in science fields in schools across Australia. With a story like his, Yves knows that building literal bridges is equally fulfilling as building metaphorical ones. 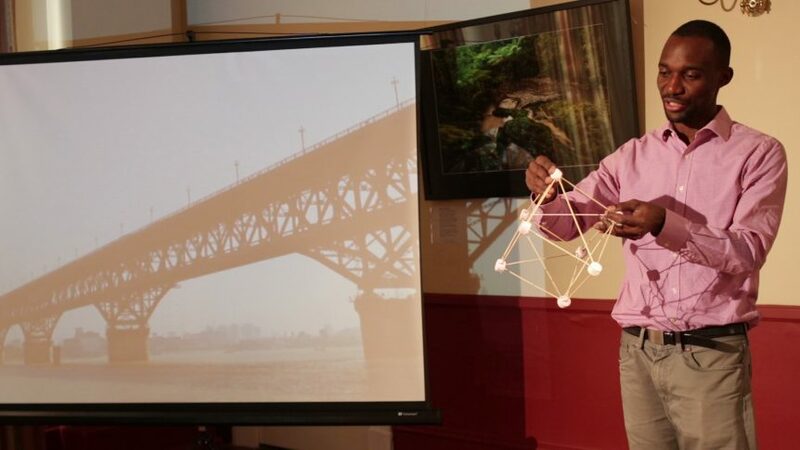 “I’ll be talking about the structural engineering of a bridge and why a bridge needs to be so strong. I’ll be comparing that metaphor of how you build a bridge when you cross from one culture to another culture, from a different community and a different country. I’ll draw from my own personal journey, from Burundi, to China, and to Australia, and how I built a bridge between those places. We look forward to Yves’ contributions to the Migrant Science Communicator Accelerator Program. This initiative was run by Cultural Infusion, the Royal Society of Victoria, and the Australian Science Communicators, with the support of the Inner North Community Foundation and the Scanlon Foundation. We will soon celebrate its successful completion, so stay tuned.